The M100 series is a comprehensive range of AC and DC transducers providing a DC mA output proportional to its input signal. With its isolation of 4kV combined with an accuracy to Class 0.2 allows the M100 series to be used with Building Management Systems, analogue and digital meters etc. The M100 series has U.L. Approval. 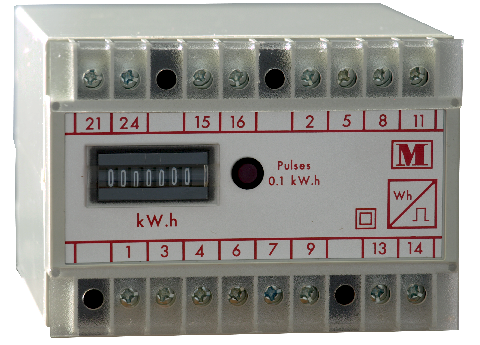 The M100-WMx kWh meter has a class accuracy of 1% (IEC1036). The M550 PowerCom is a complete single phase or three phase multifunction, RMS sensing, AC power transducer packaged in a standard 100mm DIN enclosure. The M550 is fully programmable through the communication port. An option of pulsed output via a relay is offered. It can be assigned to W.h, VAr.h, (import or export), A.h or VA.h. 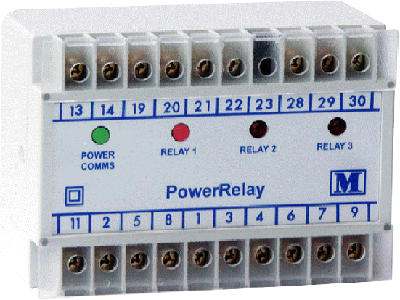 The relay can also be used as a control relay. The accuracy of the M550 is Class 0.2 to IEC 688 over the range 10% to 120%. For Active and Reactive energy the accuracy is 1% of reading to IEC 1036. The M552 C-Tran is a Current Transformer complete with an integrated three phase, RMS sensing, multifunction AC power transducer. The M552 C-Tran is fully programmable through one of its two communication ports. 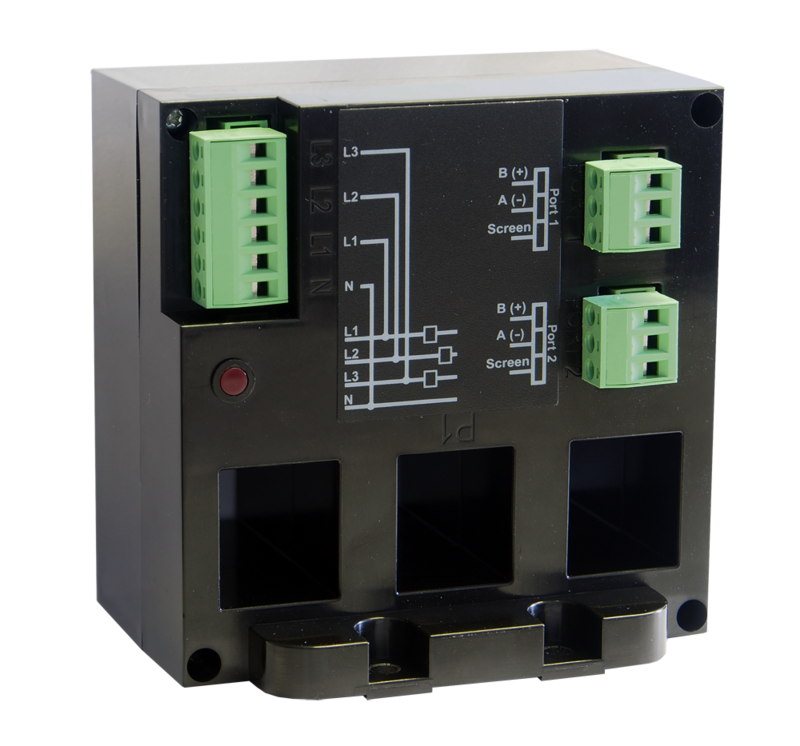 The M552 C-Tran can drive a number of LCD meter terminals using its second RS485 network. The accuracy of the M552 transducer is Class 0.2 to IEC 688 over the range 10% to 120%. 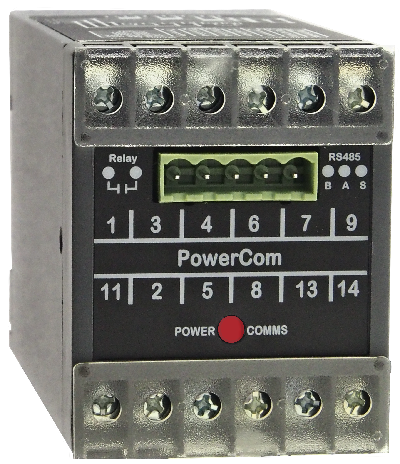 The M553 ac PowerCom is a complete single phase or three phase multifunction, RMS sensing, AC power transducer packaged in a standard 50mm DIN enclosure. 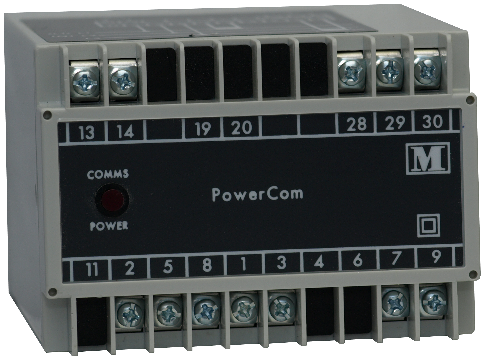 The M553 dc PowerCom measures dc voltages up to 1000V and has a low voltage input for shunt connection. The M553s are fully programmable through the communication port. An option of a pulsed output via a solid state relay is offered. The ac version's relay can be assigned to import/export kW.h and kVAr.h, A.h or VA.h. The dc version's relay can be assigned to import/export kW.h, A.h or VA.h. Both can also be used as a control relay. 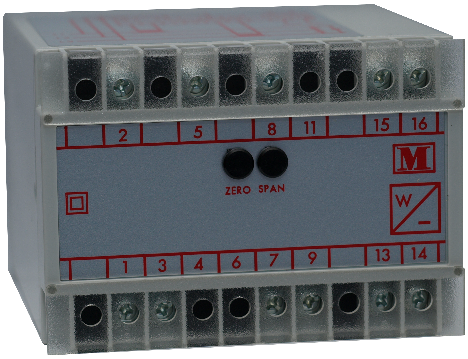 The M553 has shunt inputs for current measuring and must be connected using external CTs. class 0.3% for power to IEC 688 over the range 10% to 120%. 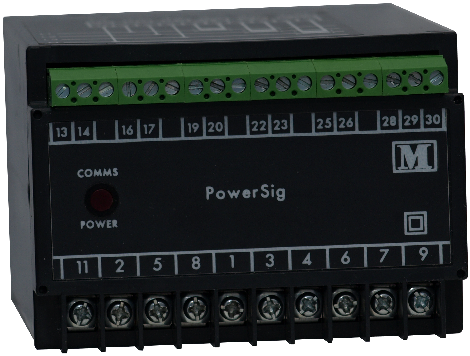 The M560 PowerSig is a complete single phase or three phase multifunction, RMS sensing, AC power transducer, providing up to 3 analogue outputs and the option of RS485 communication port. Most of the parameters measured by PowerSig can be assigned to the analogue outputs. The M560 is fully programmable through the communication port. Up-to 3 fully isolated analogue outputs are available. Most of the parameters measured can be assigned to the outputs. Outputs can be either DC mA or DC volts.